I have been blessed with knowing not only my Grandmother Cora but also my Great Grandmother Maggie. We called them Grandma and Great Grandma. 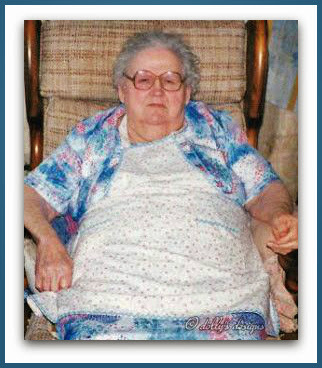 Great Grandma Maggie was born in 1880s and lived to be 92. She was such a delightful and funny woman. She didn't mean to be, in fact she was kind of crotchety, but for some reason that made her even more endearing. She would have her purse in her lap at all times (like the Golden Girl Sophia) while she was resting. This of course would be on Sundays because the rest of the weekdays were meant for working. She never wore pants that just wasn't heard of. 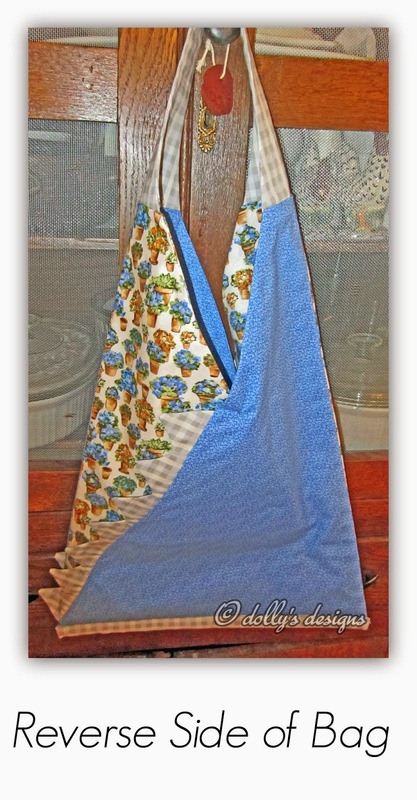 She did wear her apron to keep her clothes clean. 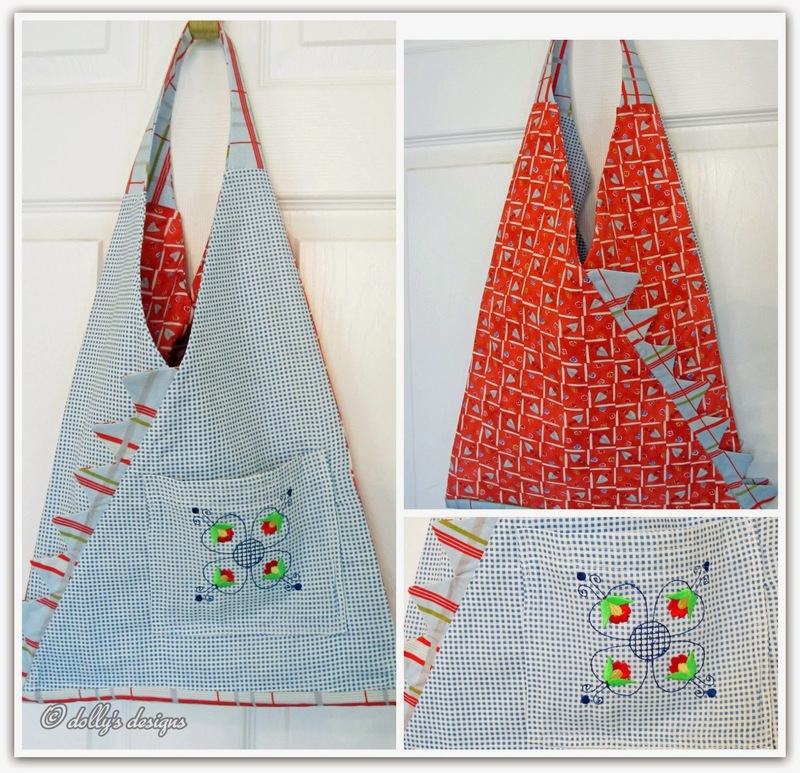 Chit Chat Giveaway & Handmade Bag Winner! 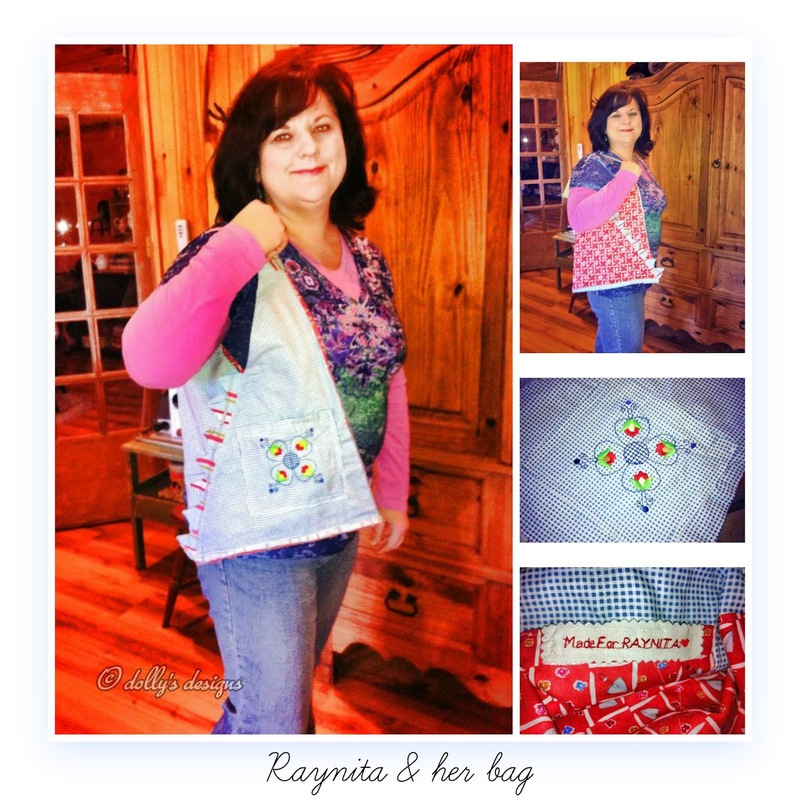 I'm so thrilled that the winner of my giveaway over at our Farmgirl Chit-Chat Page was Raynita. You should join us over there we have wonderful things happening everyday. Quote from Raynita: Oh, my goodness! Would you all just look at this pretty purse I got in the mail today from Dolly Johnson Sarrio?!?!?! It is fabulous! It's in the 70's in Oklahoma today with loads of sunshine and blue skies. My daughter opens the mailbox and there is a box containing this precious gift from Dolly and my MaryJanesFarm magazine. It is a grand day indeed! Thank you, Dolly!! I love this group! Isn't this special?!?!?! Had to add this pic. Tells me a lot about you, Dolly....an extra touch:) I love it! When you make something for someone it becomes a personal project. A lot of thought goes into anything that you make anyway if it is a true love of yours. You know it is special to you but then again it is rare to see how much something means to someone else. This project and precious person allowed me to see how people do react to something that you make. Thank you so very much Raynita for such wonderful compliments! It does mean a lot. Raynita and her family will soon be part of our Hibiscus House Spotlight Stories, so stay tuned! 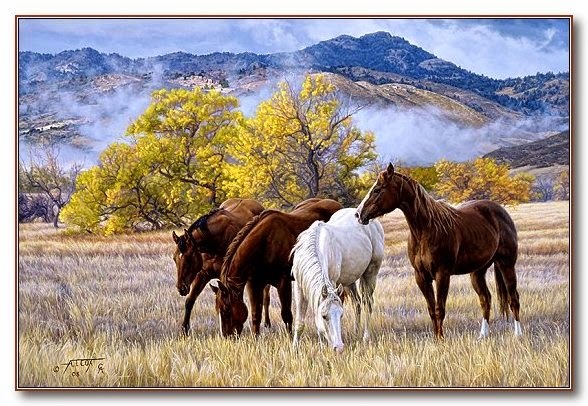 Come join our group Heidi, Deb, Debbi, I and lots of wonderful new friends! 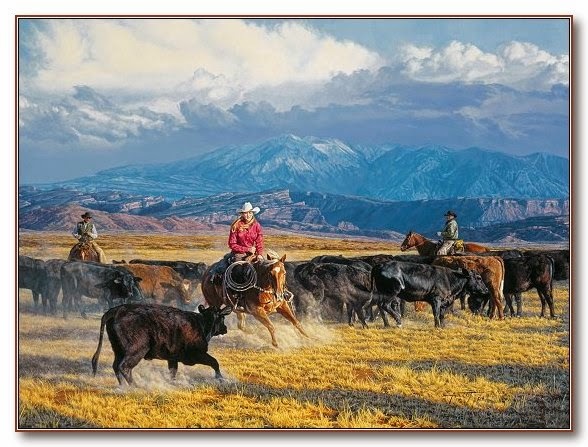 "The Blowup" is the most action packed painting Tim has done in a long time! 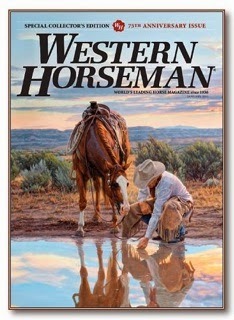 I absolutely love bucking horses and their significance to the cowboy lifestyle. 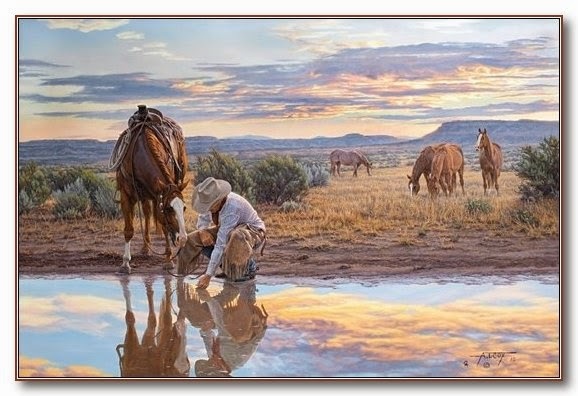 "The entire time I was working on this painting, I was thinking about the vanishing way of life of the cowboy. 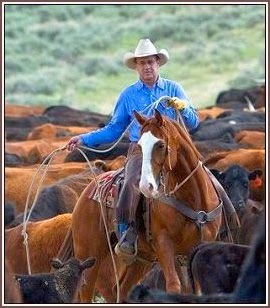 Phil Bidegain is one of the owners of the T-4 ranch and the president of the NM Cattlegrowers. 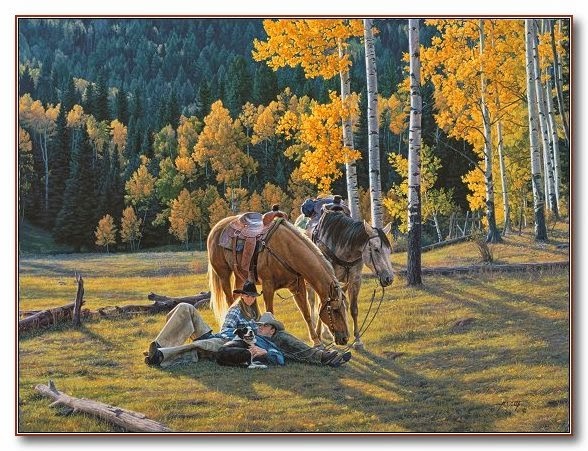 There is a lot of symbolism in this painting. 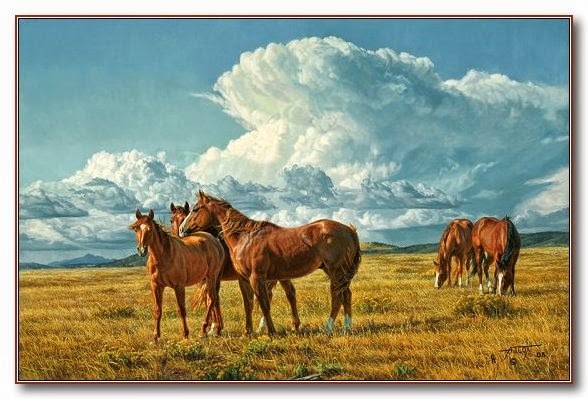 The clouds and storm in the background - troubled times. The ray of light - hope. 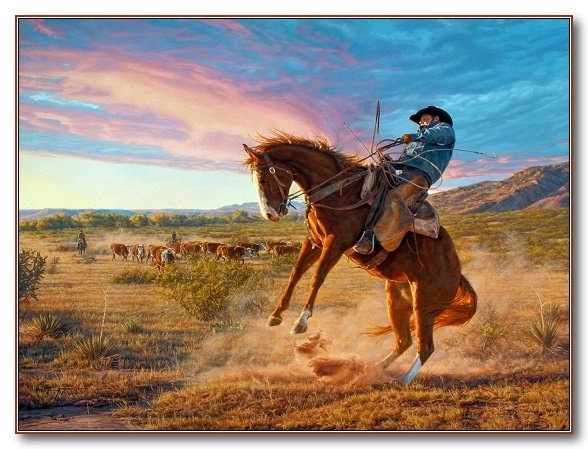 The rider out front sitting tall and straight in the saddle - head up looking to see the future. 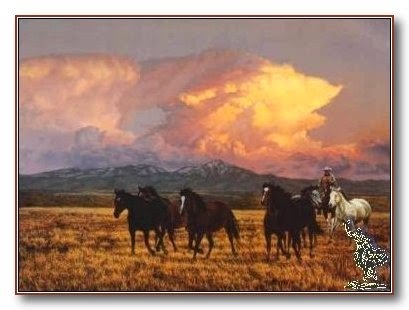 He is surrounded by light, but also bushes of mesquite thorns representing the daily challenges. 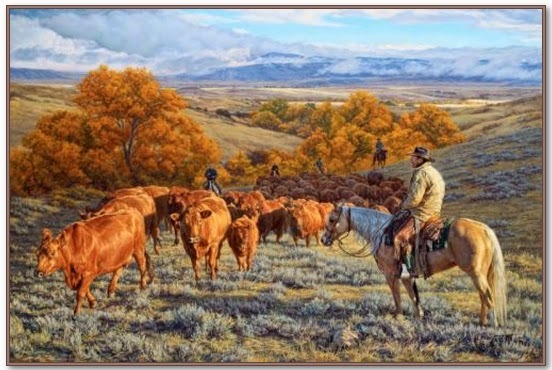 The cattle are highlighted with a golden glow, which is their wealth. 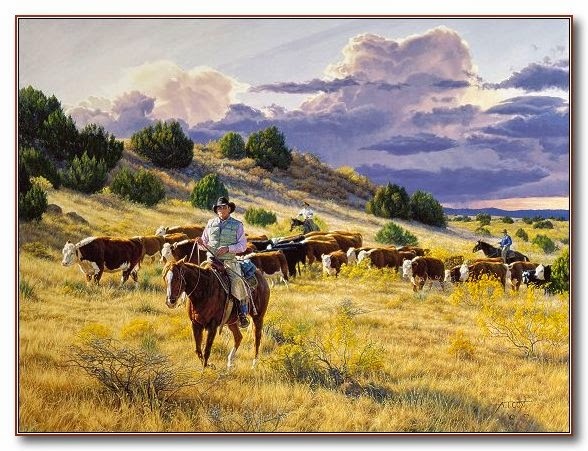 Phil is out front of the herd with his loyal hands leading them all "On To Better Pastures". 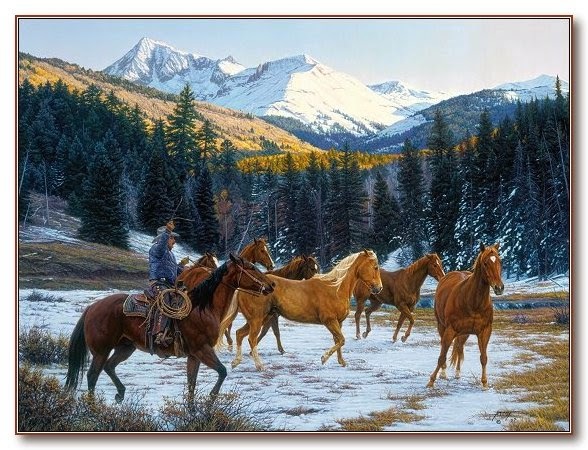 This painting depicts several of our favorite horses in the winter of their lives that went on to better pastures where the sun shines on the mountain tops. 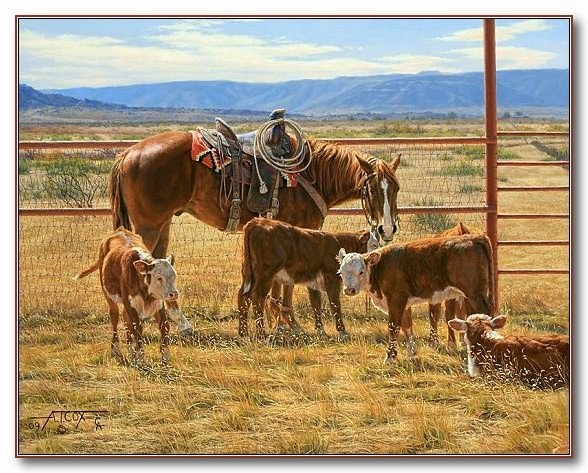 "Every ranch I have ever been on since I was a kid the young cowboys complain about the long days and short pay. 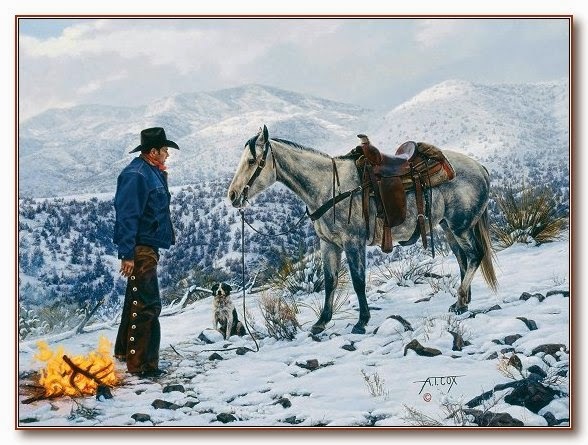 I am sure the horses feel the same way. 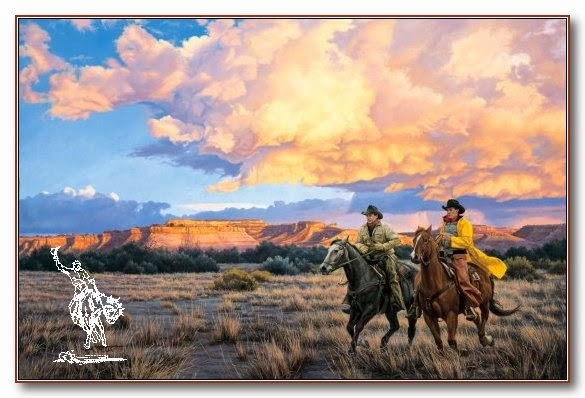 Then there are the cowboys that have figured it out that it is not about the money it is about the moments; the beauty and peace of riding out to meet a new morning , seeing a new born calf or foal, the freedom of the open spaces, glorious sunsets, the satisfaction of a job well done and all life's little pleasures make it worthwhile." I'll leave you here. 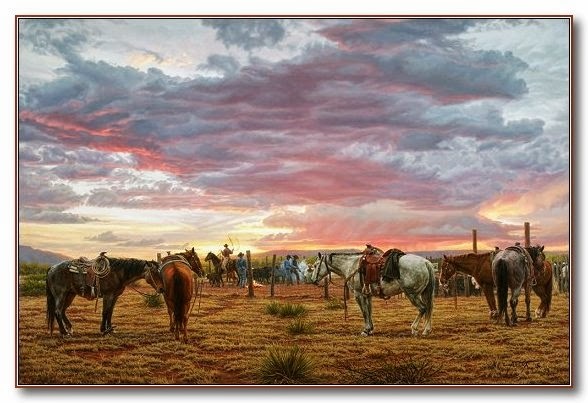 I hope you've enjoyed your tour as much as I.
I have placed links to each painting so that you may see more information. 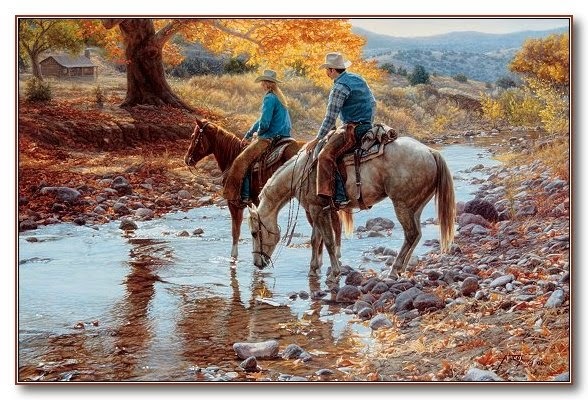 Tim and Suzie would love to have you come visit their website. I can tell you it is an experience you will enjoy. I'd like to personally thank Tim and Suzie for sharing so graciously this beautiful artwork. This was a labor of love. It really was. I have been too long away from my sewing/embroidery machine. 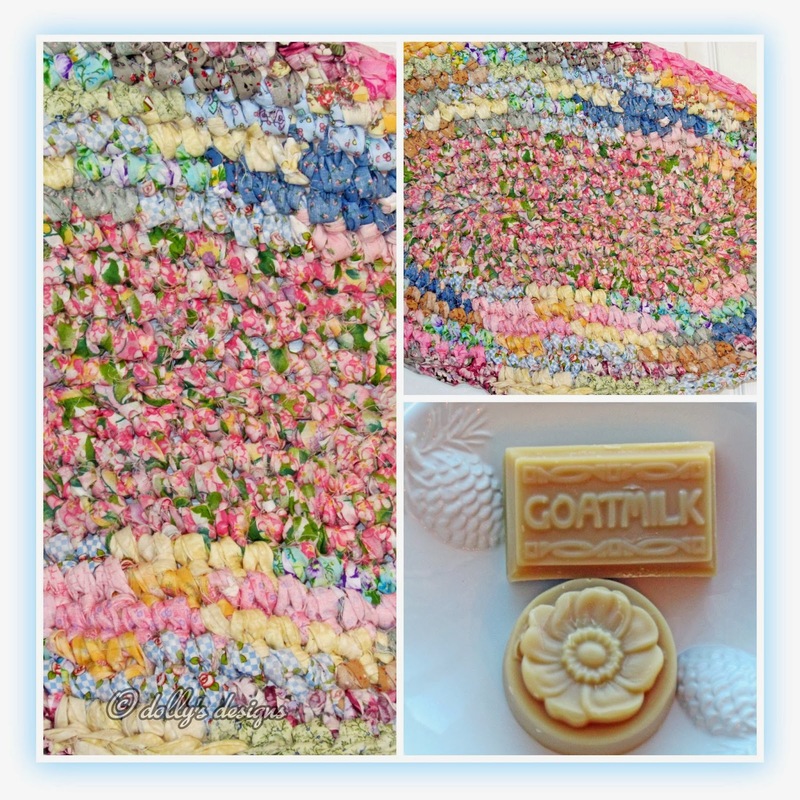 Look at the beautiful fabric colors in the handmade rag rug. She is very talented. Look at this gorgeous Quartz. It is hollowed out some to insert a tea light candle. 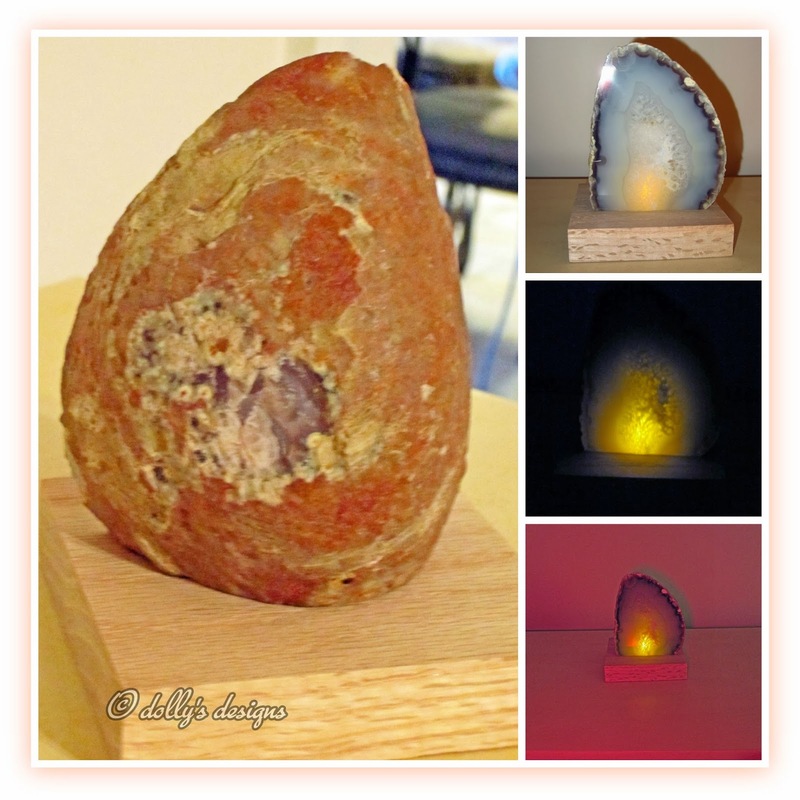 Michelle's husband Rick made the base for the candle that holds this piece of quartz. Talent runs rampant in that family. She found this in Quartzsite, Arizona. It is impossible for a photo to show the beauty of this as the light flickers through the stone. A great big thank you to Michelle and Rick! I can't wait until she gets the things I made for her and hope she likes them. Have a great weekend and remember create something! 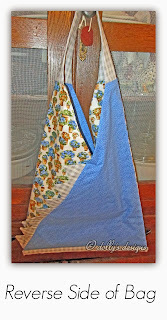 This is Hoodie's Collection Pattern from Simplicity. I like the simple aspect of the design, although it takes a little time to make. This bag was to be in with the Octagon Surprise Package Giveaway. The winner of that contest turned out to be a person that I was having a craft swap with and I'd already made one for her. Making something different for her now so she won't have two of the same item. This particular bag is made from premium cotton fabric made in London, England. You can see and feel the difference in premium fabric. It's a difference that I love! 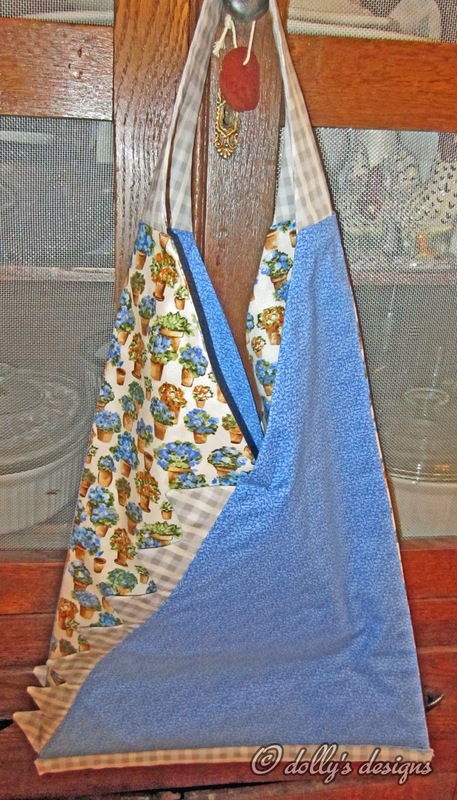 This bag could be used as a purse it was made from a purse pattern. 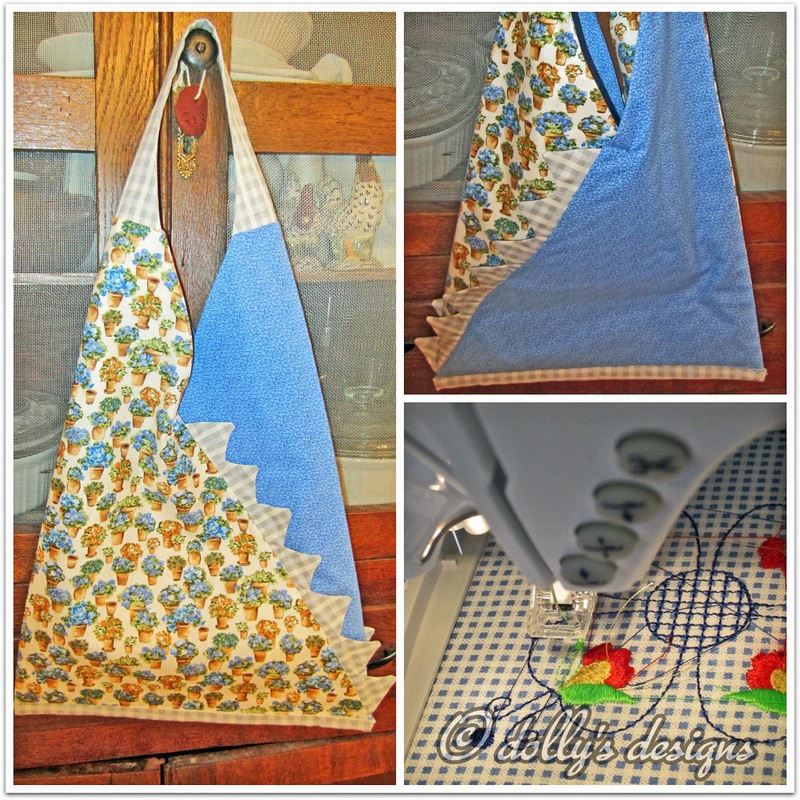 It could have so many uses, clothes pins, stockings, yarn, craft supplies, beach bag, oh anything you can think of bag! The lining is made from the very same premium fabric. Sewing and will post others after recipients have gotten theirs. 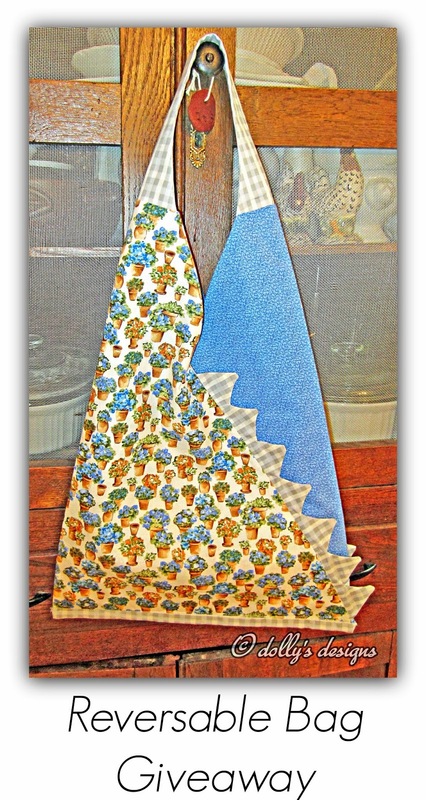 I will be making and selling these very useful bags soon to sell. I do request that you Follow dolly's designs in some form or another, even through email if you wish. Tell me how you follow and leave your email address so that I may contact you should you win. Thanks a bunch!